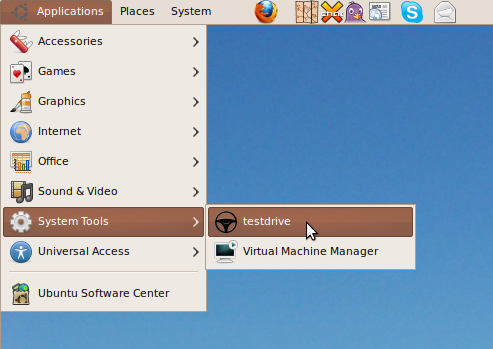 TestDrive is a project that makes it very easy to download and run the latest daily Ubuntu development snapshot in a virtual machine. 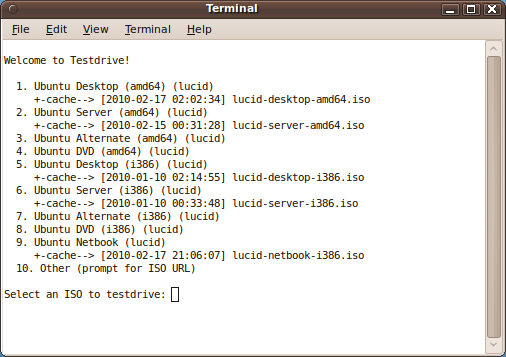 Actually, it can be configured to download and run any URL-access ISO in a virtual machine. But the primary goal is to provide a very simple method for allowing non-technical Ubuntu users to test and provide feedback on the current Ubuntu release under development. Then, a menu will pop up, with a menu of Lucid daily images. If you have previously downloaded any of these, you should see a time stamp of the cached file. If you run testdrive everyday, your cache will stay up-to-date, and the incremental download will be much faster! Select one of the offered ISOs, or enter a URL to another one of your choosing, and you should be off and running.